I love pumpkins. Have you seen all the varieties available now? White, yellow, speckled, and the very popular orange. What is it about orange? It's a happy color! Look at that little scarecrow girl with her ponytails standing straight up? So cute and perfect size to put in the window box outside the kitchen window. Trader Joes is great for tempting me with specialty foods. On our last trip in, they had a large variety of pumpkin items! DH had the "O's" and in his usual one word comments stated they were "crunchy"
Looking forward myself to the oatmeal with pumpkin. I like a low sock but so many slide down into a shoe as you walk. These don't. Feetures! fit snug like a glove, and note the little "L" at the toe?? For left. Not for stupid walkers, but because of the arch support built in. Awesome! And I have very high dancer's arches that like support, so these running shoes, Asics are working so far. The stopped making the Avia style that was perfect, high arch and flexible sole. Should have hoarded them, but companies do not warn me they will discontinue my favorite brands. Grrr. Generally for the machine I like Schmetz. I have discovered Superior Titanium topstitch. I LOVE these really strong, sharp, long lasting coated needles that seem to work for all threads, seaming quilting and, well, topstitching. I just bought the tulip hand sewing needles as I need, a very sharp thin needle to sew my hexies. These supposedly don't bend as much and last longer than others. We'll see, I'll tell you after I tried them. Set in Wales and England, a couple falls in love and the antics between their respective family and friends will have you laughing too. I love the accents and the different phrases as well. We got this from our library. Just a pinterest picture, because I didn't get a picture of the pair of poodles we met Sunday in Home Depot. 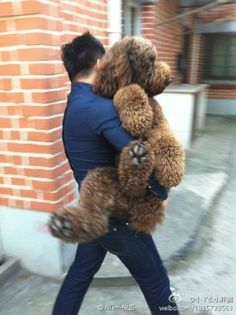 I called to the owner so he'd stop and let me have some poodle therapy. The brown one was a super lover, who leaned against my hip while I petted and petted him. I did poodle things, like play with his ears, talk to him, look deeply into his eyes while talking to the owner. It was therapeutic in several ways. First poodle hair therapy. Then the lkind owner helped me feel better about our choice with Cole, reminding me of the necessity of our decision to say goodbye when we did. Third, that night I decided to put in an application for a rescue poodle who's also 6. I had been reluctant, having always had puppies. But the thought of having one of these gentle giants come home with me gave me an emotional boost. Cole would have loved them. I'd love the rescue poodle too. As we've done before, let me know if you did a "Things I like" post in the comments. I'll set up a link party soon! Not exactly a "finding the muse" post but this was too good to pass up. We went for a walkabout to the mall last weekend and I spied some interesting and stimulating displays in Crate and Barrel. This wall art is metal I think, didn't get too close but it's very modern quilt looking isn't it??? I think I might just try doing something along these "lines" pun intended. And that color! And the glow! There are lessons to be learned everywhere. In fact working my fingers to the bone! My quilt is based on Matisse's papercut series and I "toted" it to a recent bee meeting in order to add some beads. What it lacks in size is made up for in embellishments! Any way... thought you might enjoy seeing a bit of what's out there in stores for Halloween. The displays are awesome, and while I aspire to entertain using these items, I just don't have the storage. Yep. That's why I don't buy them! As I wrote before I am in the middle of a re-organization in my sewing space. I am dragging out storage bins, and seeing what's there, adding in newer supplies. I am deciding just how I can find that magical balance between storing supplies and using supplies. I have discovered a lot of treasure that has been put away for years like a Time Capsule. I find I need clear space to create, but when things are put away I forget about them. This rolling cart lives next to the cutting table and holds small templates, all my marking tools, some paper piecing patterns, and drawers of components. These are small bits I sew and put away to be used later. Then forget about. Including the red blocks you see in the top picture. The RSC issues a challenge to make blocks in designated colors each month from scraps. This month is rose red and gold. Ewwww. That combo...ewww. I am still not sewing much, as grief has sapped my creative side, hopefully temporarily. I feel I may be coming out of it a bit lately but have not continued to do the rainbow scrap challenge this year. I happened onto these red blocks in my components drawer. Apparently one year, I sewed some of those tiny scraps together, and liked them enough to put to the side til I decided on a setting for them. If I don't write this stuff down, how will I ever remember?? Do you do that? Think you'll remember and then can't? Anyway, because the challenge is red, and these are red, and there are tiny splashes of gold in the square blocks I'll share them. 1. Do you make blocks with no purpose in mind? 2. Where do you keep components that are simmering? 3. Is it true "out of sight is out of mind" ? If so, then how do you balance storage with using them? My word of the year is a phrase, "use it" meaning use what I have be it supplies or talent. Recognize the possibilities and use what's in front of me. My friend Monika suggested essential oils might lift my sagging spirits. This blend is from Whole Foods. When I catch myself bursting into tears yet again, I open the bottle and sniff. About three times. And I'm surprised that the tears stop, and I can resume life, already in progress. Thank you Monika... it seems to take the edge off. Better living through chemicals. with Morgan Freeman and Virginia Madsen. Well written, superbly acted, entirely charming. All that and a yellow lab. We watched on Netflicks. We both LOVED this film. You will too! 3. This cheese spread made with cream cheese and feta... so very good.This one has roasted red peppers. 4. beautiful drinking glasses. We got these at Sur la table on clearance. They said hand wash so I promptly put them in the dishwasher, as I do not enjoy doing dishes. They survived but your mileage may vary. I love pretty dishes and glasses, it makes drinking all that water a better experience. 5. "Order"... I'm putting the studio in order, or trying to. The Studio is trying to remain in it's comfy zone of chaos. This stuff is not new, it's just all been jumbled. I decided I needed to pull out some boxes and see what has been hiding in there. Lots of cool stuff. Don't you find when you put things in tidy boxes on tidy shelves, you forget to use the supplies? I do. When your life feels out of control, it's comforting to sort, organize, and pare down, right? I looked at the old organization that no longer works. This week, I am putting "like with like" meaning I start with laundry baskets, marked with categories such as "UFO" "components" (little bits sewn but waiting for an idea to use them) "books and patterns" etc. As I sort, I toss items into their baskets to make decisions about later. The newer "un-put-away-stuff and the older forgotten stuff all go together in these baskets. You gotta know what you have to know how to store it. Then I know how large a box I need for that stuff. I also found a lot I'd like to work on. To my credit I did not stop to work on it instead of doing the sorting, lol! I realized there are other parties kind of like the one I proposed so I need to think about how mine should work. If you wrote an "I Like" Thursday post this week, please leave a link in comments so we will know to come look. I am still figuring out how to do a party. mysewingroomsara this is a pic of a 50 statue of a native woman and quilt, awesome!! What did you find to like this week?? The winner is Claudia! I drew names, and only wish I had one for each of you. I will be checking out your fave authors for my next books, and stay tuned for more giveaways coming soon from me!! Thank you to Frances Dowell for the opportunity to discover your storytelling. I was sent this book to preview and enjoyed it very much. My friend Mary who used to work for the Library of Congress, and after retirement worked as school librarian for her son's school, bought Ms Dowell's books for young adults, was happy to hear she was writing for adults. I'm not a professional critic, just a happy reader who knows what she likes. 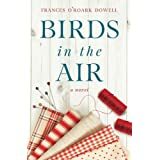 I woke up this morning missing the characters in Frances O'Roark Dowell's new novel Birds in the air. I found this lighthearted book easy to read. I love a "slice of life" book and I found myself immersed in this modern day story. The characters are so real and developed I began to think of them as friends and actually miss them today! I want to know what they are doing now. I relate to the main character Emma. A writer who discovers the love of quilting and longs to belong in her new town. I have been in a similar situation. The dialogue and story line are real and engaging and quilters will love being reminded of their introduction to quilt making. I want to know more. Frances, please stop what you're doing and go write. Stop eating, sleeping, and watching tv, and go write another story for us to enjoy!
" ... the book comes out September 24th. Have we talked about doing a give away? If you want to hold off until the 24th and offer a give-away, I’ll mail a book directly to the winner"
So there you have it, a chance to win a copy of this novel. Hot off the presses. In order to win a copy simply leave a comment below. Entertain me... tell me about an author you enjoy so much you've read just about everything they've written. I am reading as fast as I can several other series and love to read.... how about you? I'll choose a winner , probably a drawing to be fair, and the author, Frances Dowell will send you a new book to read. Closing date for entry will be Sept 26th. Good luck and thank you for reading my words each week. Labels: book love, give away! "Watercolor Summer" 25" X 28"
I feel good about this. I am sewing again. The swing was a bit too subtle with just the couched ribbon, so I added the "seat" from scrapbook words. The free motion feathers in the two bottom corners. I didn't get a close up of the spiral stitch, which is one reason to keep that aging Bernina 1630, but I here's the key stitch, straight stitch, then the spiral stitch all on the little inner turquoise border. I like the little word peace hanging there under the swing. I sewed again. That's a good thing. A few of my favorite things... the title of this quilt made early in my quilting career, about 1995. "Never give up, this may be your moment for a miracle" by Greg Anderson. It was my first sampler just figuring out how to set different sized blocks. It hangs in the studio as one of my favorite quilts. I was tagged by my friend Easy who's Mama blogs at EasyBlog about her life with a weimaraner in France. We are to list 5 things we really like. Well, I made a list, and realized there are lots of fun posts here!! So I thank her for tagging me! I've decided to replace the Muse series on Thursdays with the "I Like Thursday" series, and plan to start a link party for all who want to write a post of their favorite things. Stay tuned!! So let's start with a general list, shall we? 1. My husband must go on the top of the list. He and I share so much in life and he's my best friend. Well, I should say dogs since I also loved my labradaughter Chelsea. I am currently trying to recover from the passing of my son Cole, my standard poodle of 14 years, one third of our wee family of three. maybe I should admit I like all baby animals especially elephants. 3. Art in general. Drawing, painting, sewing, beading, pottery, weaving, crafting... I love it all! I do it all! Just my art books, and not all of those! Heaven help me organize these! I like to read fiction, and have fave authors of course. I began listing most books I read on my book page. Once I read an article on what books you'd have on your special shelf. That will be another post. Right now I'm reading a tea shop mystery, a book on lettering, a book on how to cope with grief of loss Never letting go by Mark Anthony. books take me to other places, they inform me, and they open my eyes to new thoughts. 5. Entertainment. Oh how I love music, TV, movies, theater especially musical theater. Have I ever told you I was in musical theater? I was. I love singing and dancing, maybe not auditioning but it's part of it. As a young 20 something I admit to claiming to be a singer/dancer on Broadway when meeting strangers at a party. A slight embellishment since the closest I got to performing on Broadway was Tampa. Still... it was an ice breaker and harmless fantasy to become someone else when meeting a bunch of strangers lol. I grew up playing piano, maybe about 9 years. Then my marching/concert band clarinet playing took over through high school. Now I am trying to learn Ukelele. I make up silly songs about the ordinary moments of my day. I'll make up a song about putting away dishes for instance. Keep in mind, I'll be starting a link party on Thursdays so concoct fun posts that showcase some thing that makes you really happy! I forced myself to go into the studio this week, and realized you can find the Muse while finding your stuff. Is anyone out there as messy as I am??? We are in the Pilot program, pile it here, pile it there. I had created an archeological dig in the studio. Just keep throwing bags in, PIGS (projects in Grocery sacks), new fabric and beads, books, etc. I was barely able to find a path in. This week, after coming to acceptance... I decided to be brave. AMAZING! I found things I thought were lost forever, or accidentally thrown away. I found this bag, this magical bag full of finished and nearly finished beaded projects and tons of beads! Yea! I found supplies I've looked for for months! The shiny packets are some iron on baguettes (beads), some piping, some labels. These were from some scraps given me, some odd strip sets. I cut them into 9-patch size, and resewed them. It might become a table runner with some sewing room fabric borders. Or a valance. The point is, it got me sewing. I also sewed together some floral scraps given me... these things are good to do when you need to sew but your brain isn't firing on all cylinders. I'm making a tote bag with it, stay tuned as it's turning out so cute! It says, "the world is not going to come to you. The sooner you realize that, the more time you'll have to pack"
We have had changes befall us recently, and there are some changes we need to make. There are even some changes we WANT to make. "Sue, sorry to say, you will not, NOT come out ahead. You will leave countless yards behind because we need a critical mass of fabric in which to nest. That's what we do, we "collect" fabric. Uh, guess in all my measurements I didn't stoop down to notice the cross bars... which means the two shelving units WON"T fit side by side under the table. Back to the drawing board... now how to fit more fabric into the studio?? With me in there too??? We went to market yesterday. From the number of languages being spoken, it was an international market. The great leveler. The big common ground. I like to see it all. While there for one thing, I happened into the children's section, and saw this "POODLE" toy. At least that's how I saw it, and there were children running into the poodle toys. I said to dh, "that's a great Poodle house!" An English speaker stopped to show us pictures of her 5 poodles, lol! We shared poodle talk for a bit, discussing things like breeders, hair, lumps and bumps. Antonius shelves. Four sliding baskets to hold fabric. My studio is full of Fabric. And I always want more. I even dithered over the $4.99/yd IKEA fabric, at 50" wide, with big graphics. Cotton. Buy new shelving units, Ding Ding Ding! After DH puts the units together of course. I also scored this find... I do love Halloween. I thought this might be fun to stencil some images onto fabric for some gifts. I found it at the Paper Source store. And a big purchase at Bed Bath and Beyond, a new water sprayer for the studio. I don't put water in an iron, I keep a sprayer instead. Mine broke after about 8 years, and I was sorry because I liked it. So there you have it. Studio purchases. I hope to return to creating soon. Isn't a studio like a playhouse? Mine is... and there's no adult around to tell me to clean my room.